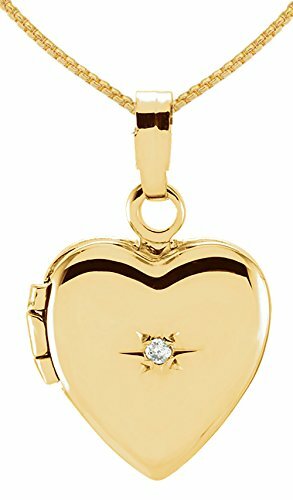 A brand new polished 14k yellow gold heart locket with a 1mm diamond in the center. It comes with your choice of a 16in, 18in, 20in or 24in 14k gold chain with different styles and sizes: a 1.1mm, 1.5mm, 1.75mm or 2.0mm rope chain, a 1.5mm box chain, or finally a 1.5mm cable chain. A locket is a pendant that opens to reveal a space used for storing a photograph or other small item such as a curl of hair. Lockets are usually given to loved ones on holidays such as Valentine's day and occasions such as Christenings, weddings or birthdays. MADE WITH 14K YELLOW GOLD: Our premium quality pure 14k yellow gold provides a top quality shine and durability. SIZE AND MEASUREMENTS: Cross pendant is 11.25mm in length and 10mm in width. Size comparison - US Dime: 17mm, US Nickel: 21mm, US Quarter: 25mm. Take a look at the sizing image for more details. CHOICE OF CHAIN: Our pendants comes with your choice of a 14k yellow gold 1.1mm, 1.5mm, 1.75mm or 2mm rope chain, a 1.5mm box chain, or finally a 1.5mm cable chain in either 16in, 18in, 20in or 24in sizes. (Custom lengths are available upon request). All chains are made of 14k yellow gold with highest quality and longest lasting endurance.